First, a confession. I am one of those hapless cooks who almost always fails to read a recipe until I am actually making the dish. As you might imagine, this leads to a lot of problems that could easily be avoided. Like, halfway through, oh you have to marinate this overnight? Or, why didn't my ice cream turn out? Because you don't cook the buttermilk (see previous post). I am of the opinion that this lack of reading comprehension is eventually going to affect us as a society, and I am saddened to admit that I am one of the lazy, skimming masses. In light of recent mistakes, though, I am going to try and mend my ways. After actually reading several recipes, I have successfully made a batch of delicious, tangy buttermilk bay ice cream. The bay compliments the buttermilk nicely. 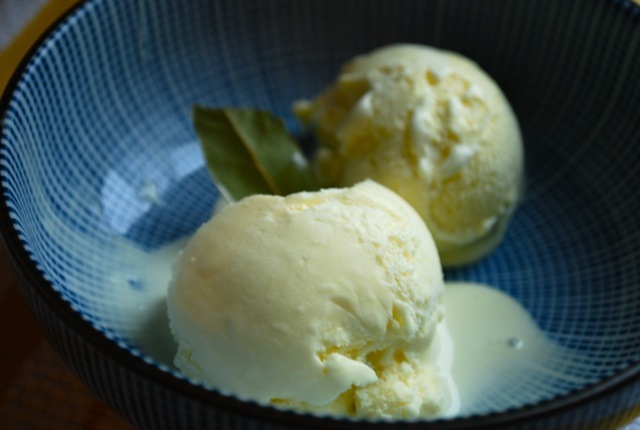 Lighter than a typical whole milk and cream ice cream, this is a refreshing break from some of the season's heavier desserts. Absolutely sublime. Some notes on the recipe. I go pretty light on the sugar here because I want the delicate flavors of the buttermilk and bay to come through. When adding the by leaves, be sure to use robust, whole leaves, since you don't want them to crumble into your ice cream. Also, count the number you put into the cream so you can be sure to get them all out. Dried bay leaves add great flavor, but the actual leaves do not taste very good. In a large saucepan combine the cream, salt, and half a cup of the sugar. Heat gently over medium-low heat until the cream just starts to steam. Off the heat, stir in the bay, and steep for 10 or more minutes. In the meantime, separate your yolks and whisk with the remaining 1/4 cup of sugar. Set aside. Remove the bay leaves from the cream mixture, and reheat over medium-low heat until everything is starting to steam. Whisk one ladleful of cream into the yolks, and then several more to temper the yolks before you add then to the cream. When the yolks are sufficiently warm, after 4 ladefuls or so, slowly whisk them into the cream. Continue cooking over low heat for five minutes, or until the mixture thickens enough to coat the back of a wooden spoon. Remove from heat, stir in the buttermilk, and chill for five hours. Process the ice cream according to your ice cream maker's instructions, and then cure in the back of the freezer for at least a couple of hours. Serve with a bay leaf garnish if you like.